Movement of the fingers and thumb is effected by tendons attached to muscles in the hand and forearm. Tendons are like little ropes that course out along the finger, attaching to one or more bones. When the muscles contract, they pull on the tendons which move the appropriate bone(s). 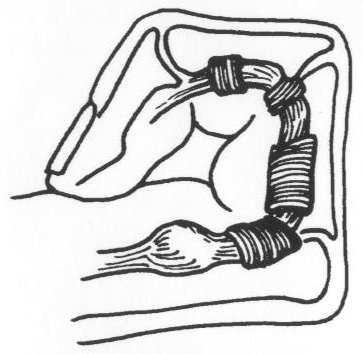 To allow the fine coordinated activity of our fingers and hands to occur, the tendons are guided in their course to the fingers through a series of loops, or pulleys, of fascia or connective tissue. These pulleys hold the tendons close to the bones and impart maximal mechanical advantage to the muscle-tendon system. In trigger finger and thumb, mechanical obstruction to tendon gliding within the pulley system occurs. This can occur either from enlargement of the tendon (usually caused by inflammation) or of its synovial lining. Occasionally, the pulleys themselves may become constricted, also interfering with normal gliding of the tendon. In early cases, patients may experience discomfort in the hand. In more advanced cases, a mechanical block to finger motion may be produced. This can result in “snapping” of joints of the finger as it is bent and straightened, and ultimately in locking of the digits when they can not be moved at all. Most often, an inflammatory nodule on the tendon is the cause. Its origin is sometimes spontaneous, though it may be associated with overuse of the finger, or with inflammatory conditions such as rheumatoid arthritis. Other conditions in the hand may be caused by the same underlying inflammatory condition, and so it is not uncommon to find trigger finger associated with carpal tunnel syndrome or other inflammatory conditions. Patients often think that “triggering” is a problem with one of the joints of the finger. 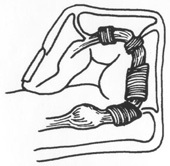 Though the catching sensation may localize to a joint, the problem usually lies in the tendon and its pulleys or sheath. Painful and triggering digits may improve with rest, splinting, or anti-inflammatory medications. The most direct and effective method of delivering anti-inflammatory medications to the site of involvement is by injection. Hence we may recommend an injection into the flexor tendon sheath. A small number of people are allergic to steroids, and they may cause skin discoloration, or even weaken the tendon. These side effects are rare, however, and usually steroid injection is the safest and most direct method of treating a trigger finger or thumb. If a digit is locked and can not be straightened, or if conservative methods fail to alleviate the discomfort of locking, surgery may be warranted. Usually, this involves cutting the pulley which is responsible for the mechanical block. This can be done under local anesthesia as an outpatient. After surgery a light dressing is applied to the finger and hand, and stitches are usually removed 10 to 14 days later. It is important to keep the fingers moving and active, and the hand elevated, particularly for the first two to three days after surgery. The dressing and stitches must be kept dry until they are removed. It is usually possible to go back to light activity a few days after surgery, though heavy activity may have to be restricted for three to four weeks until the skin has completely healed.